A new CHPI report out today using findings from the Care Quality Commission’s new inspection regime for private hospitals suggests that there continue to be risks to patient safety associated with the distinctive nature of private hospitals in England, compared with the NHS. Consultant surgeons at two hospitals who either had no indemnity insurance, or who failed to show that they had any. This is a legal requirement intended to ensure that patients have the ability to claim damages against a medical professional if something goes wrong with their treatment. In seven hospitals clinical outcomes were not monitored by the hospital, or were not known, and in two of the hospitals clinical incidents – i.e. episodes of care where something goes wrong – were not always properly reported. In six of the hospitals inspected the assessment of patients prior to surgery was found to have shortcomings. Patient assessment is particularly important as most private hospitals do not have intensive care facilities or back-up specialist teams, and so should only admit relatively low-risk patients. Private hospitals in England are now treating a steadily growing number of NHS patients. As private hospitals operate a different model of care from that of NHS hospitals this raises the question of whether NHS patients treated at private hospitals are exposed to risks which they would not encounter in an NHS hospital. The report also found that some patient safety risks appeared to be present in hospitals which were subsequently rated by the CQC to be ‘good’. The CQC inspectors did not collect identical sets of data for each hospital, or always use the same definitions for the data they did collect. This makes it impossible to determine the significance of all the data or to compare results amongst hospitals. This problem affected data on staffing ratios, serious incidents, unplanned transfers to other hospitals and readmission rates. The lack of systematic collection and reporting of patient safety data raises questions about the adequacy of the CQC’s new approach to regulating private hospitals. ‘This report reveals that not only do the safety issues that CHPI identified last year persist. In addition, the variable quality of the reports means that the true extent of the risk to patient safety in private hospitals is not known. Those responsible for commissioning NHS treatment in private hospitals should make NHS patients aware of these risk factors before a referral to a private hospital for elective surgery takes place. 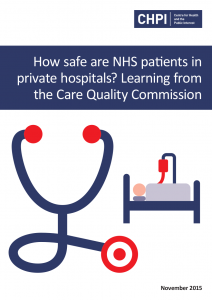 The CQC will need to develop a very much more systematic approach to addressing patient safety risks in private hospitals if it is to provide confidence to patients and the public that care in private hospitals is safe.